To coincide with the publication of his new book, The United States, Italy and the Origins of the Cold War: Waging Political (Cambridge UP, 2014), AMS's Kaeten Mistry has been discussing how American interactions with Italy in the early years of the cold war, helped set the stage for a over half century of US overseas interventions. Read the full interview here. Kaeten joined UEA in 2011 and teaches courses on twentieth century American history, US foreign relations, the Cold War and state intelligence. He is currently working on two interlinked projects that examine dissenting voices to American foreign relations throughout the twentieth century, with a specific emphasis on the rise of whistleblowers. 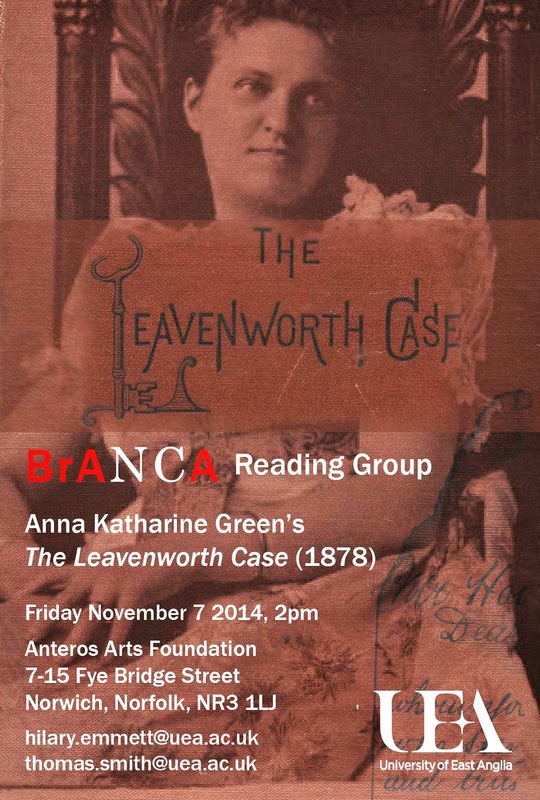 American Studies colleagues Hilary Emmett and Thomas Ruys Smith are co-organising the next BrANCA (British Association of Nineteenth-Century Americanists) Reading Group on November 7. Details above. The text under discussion will be Anna Katherine Green's pioneering detective novel The Leavenworth Case (1878), one of the bestselling books of the late nineteenth century. The event will be taking place at the Anteros Arts Foundation. If you're interested in attending, please e-mail the organisers.